The composer was cast aside by Disney for a long period as they went in a different and entirely less lucrative direction. Perhaps it was the success of Enchanted, for which Menken wrote songs which managed to slightly poke fun at his classics while being brand new classics themselves, that made them realise quite how perfect he is for them. And so, he returns for Tangled. And after that swooning build-up, the surprising news is that the songs here are a very slight disappointment. There’s magic here, there’s catchy melody, but not an outstanding number; there’s no “Part of Your World” or “Under the Sea” or “Be My Guest” or “Out There” – indeed, there are only five songs (though a couple get multiple reprises). “When Will My Life Begin” is the big number, sung by Mandy Moore as Rapunzel; its gentle folk rock is a surprise. It’s very pleasant; unsurprisingly, inoffensive. Not all that memorable, though. “Mother Knows Best” (performed by Donna Murphy as the nasty Mother Gothel) is more in the traditional Menken style with orchestra, but again it’s not right up there. “I’ve Got a Dream” is the comedic relief; “I See The Light” the romantic ballad, and the one which deserves an Oscar nomination. A duet, full of soaring orchestral and vocal passages, it vaguely evokes the ubiquitous “A Whole New World” from Aladdin. Predictably, I will say it’s not in the same league; but Menken is in a league of his own, and it’s better than anyone else would have come up with. In fact, the star here is the (instrumental) score. Four of Menken’s Oscars are for Best Score, but they weren’t nearly as well-earned as those he won for Song (and The Hunchback of Notre Dame and Enchanted are far better scores than any he won the Oscar for, but weren’t even nominated). His orchestral underscores have just got better and better over time, and this one is just as good as the wonderful Enchanted in that regard. The strangely-produced album’s first score track, “Flynn Wanted”, is a terrific piece of heroic action/adventure music which should satisfy all those who like such things; later, “Horse with No Rider” is even better, adding choir to proceedings. It’s wonderfully-accomplished music. 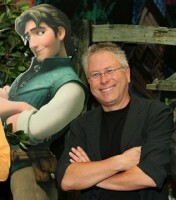 Buy Tangled from Amazon.com and help support movie-wave.net by following this link. Good review. Thank you, James. I haven’t heard the score yet, so I can’t comment on that, but I will say something about the title. Apparently after Princess and the Frog didn’t perform well at the BO, they discovered that films that could be termed “girl movies” by young boys do not do as well as they used to. These days, girls will go to boy movies, but not many boys will go to girl movies, and when one boy in a family says, “I don’t want to go to that girl movie” it sometimes keeps the whole family from going. This all sounds like common sense, but it apparently didn’t apply even in the 90s when The Little Mermaid and Beauty in the Beast were made and loved by all. So I’ve heard that in the wake of the BO failure of Princess and the Frog, this film, which was originally going to be named after Rapunzel, went through some big changes to make it more boy-friendly, and that included changing the title. That doesn’t mean the title is good. I think you’re absolutely right. But I thought the rationale behind it was interesting. Um, Hunchback of Notre Dame WAS nominated for a Best Comedy or Musical Score Academy Award! How do you not know that before you write an article?